While you may be able to “fool” your dentist for a while after you stop flossing consistently, they will eventually be able to tell. The more important question is, why aren't you just flossing? It is true that if you have not been flossing as consistently as you should be, your dentist or hygienist may not notice right away. 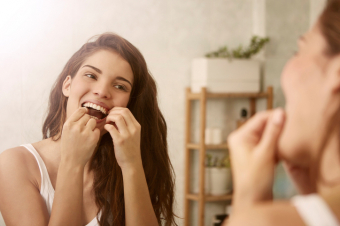 If you start flossing again about a week before your appointment, the dentist may not notice any problems because it takes about a week of flossing for gums to stop bleeding when they are cleaned. If you are young, healthy, and have a nutritious diet (all of which have an effect on your gum health), you can also decrease the outward signs poor oral hygiene for a time. However, this won't last forever. Think of it this way: if you stopped consistently exercising and eating a healthy diet, the the negative impact of moving less and eating less healthy foods might not be apparent at first. You would continue to look, and even feel, more or less the same as before for some time. But these lifestyle changes would catch up with you eventually, just like not flossing would. At the end of the day, oral health is founded on prevention and maintenance, not treatment. Making good oral hygiene a part of your daily routine will prevent problems from developing in the first place. Not flossing could lead to bacteria staying between your teeth, which causes them t colonize the tight spaces that can't be reached by your toothbrush. After a while, tooth decay and gum disease will begin to set in. Your dentist will then certainly be able to tell your oral hygiene routine is lacking! But this will be the least of your problems. In the end, we’ll leave you with these questions: What are the actual benefits of fooling your dentist into thinking you’re flossing regularly when you’re not? What's the point? Why not just floss regularly instead? Flossing only takes at most a few minutes a day, and can save you a lot of trouble and discomfort in the long run. Contact our Surrey dentists today for advice on proper flossing technique and gum disease prevention.